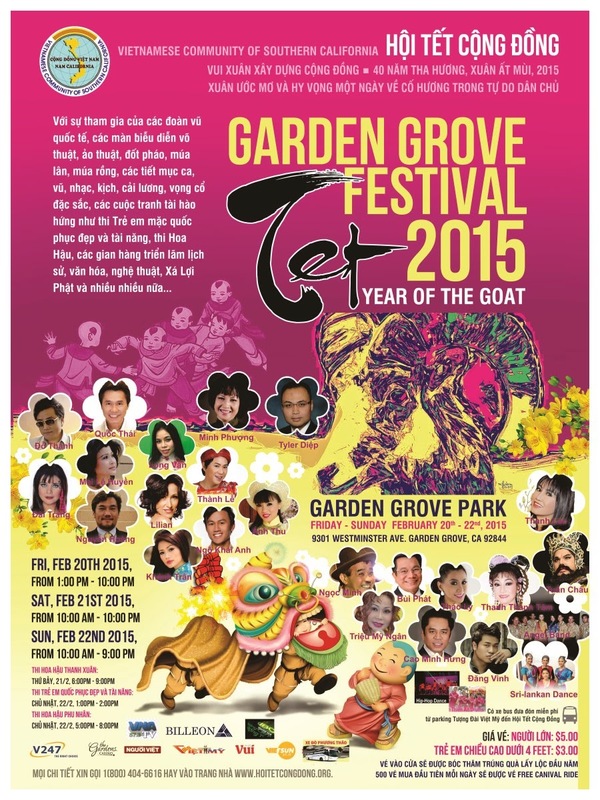 CELEBRATE TET (LUNAR NEW YEAR) WITH SOME OF THESE EVENTS! - EAT WITH HOP! 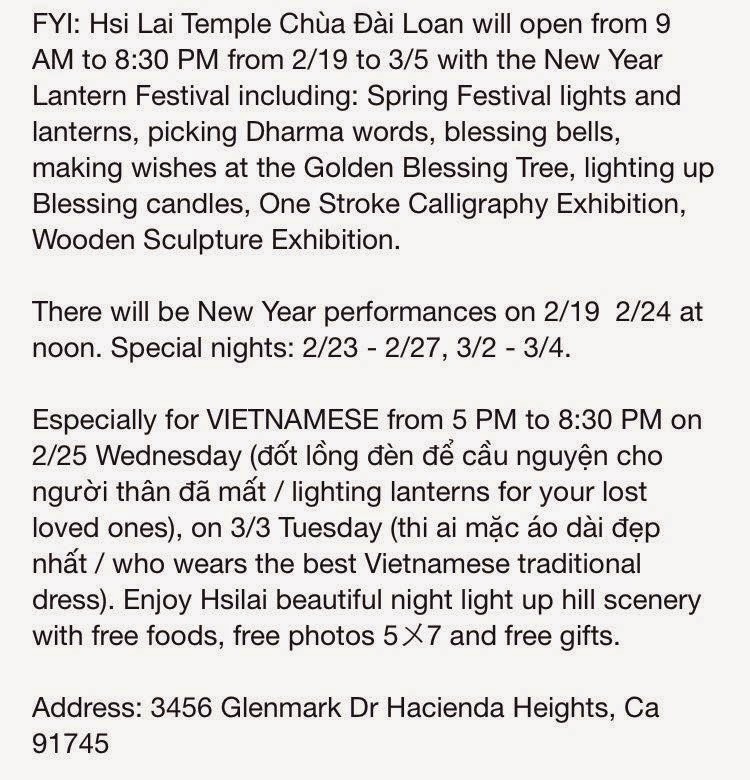 Home / ADVENTURES / CA / DATE IDEAS / DIARIES / EVENTS / NEW YEAR / ORANGE COUNTY / TET / CELEBRATE TET (LUNAR NEW YEAR) WITH SOME OF THESE EVENTS! This is a photo I took at the Lunar New Year I went to at Westfield Mainplace Mall! It was super fun with performances and live entertainment and especially freebies and discounts from participating stores in the mall! I paid only 29 cents for my Yogurtland! ASIAN GARDEN MALL (PHUOC LOC THO) FLOWER MARKET. About: The flower market's last day is this Tuesday but don't worry because AGM will have more events! I usually go to the Flower Market every year with my family to look at the vendors and buy some lucky red envelopes (li xi). This year they have a night market too starting at 6pm until 10pm! Pretty cool! To find out the other event going on later this week check out Asian Garden Mall's official webpage (link below). Highlight: Look at pretty flowers that are traditional to the TET New Year and eat yummy food at the Night Market that starts at 6pm! Price: Free to browse and Free admission. According to the wise words from a friend, "Come here early or else you shouldn't come here at all." but actually it ain't that bad. Just come early or come late because those are probably not peak times. About: This is the festival y'all need to go to. It spans an entire weekend and offers delicious food, live entertainment, education on what TET is all about and more. This festival previously was located in Garden Grove at the Garden Grove park (park next to Bolsa Grande High School) but due to some ridiculous financial requests from the city the festival relocated to OC Fairgrounds in Costa Mesa. Basically, the city of GG increased the rental price to host the festival at the park. It was too high that it was more worth it to just relocate. This will be the second time it's at OC Fairgrounds but I think it's a good change because it's a lot bigger (right?). **Across from Orange Coast College on Fairview street / Fair Dr. Highlight: Eat awesome food and enjoy the live entertainment there! Also, my friend Kaylee is participating in the Miss Vietnam of Southern California so I'm definitely rooting for her! Pageant show is on Friday y'all! There's also a talent show and singing performances that I love watching! Check out their schedule on their website! Price: $5 pre-sale online or $6 at the door for admission. Free if you wear traditional Vietnamese dress (ao dai) on Saturday morning from 10-12pm! Parking Tip: Parking at the OC Fair & Event Center is $7. But, I always just park at Orange Coast College which is across the street. It's about e 3-5 minute walk over to the festival and its freeeee! It's not free on Friday so you could either pay meter parking or just pay $1 for 4 hours or $2 for entire day which is still cheaper than $7. It is free on weekends too. I know, you're welcome ^__^. But support UVSA by parking at the event center and paying for parking if you're not poor like me... And SHHH.. keep it on the downlow y'all. About: I'm not too sure but I believe Hoi Tet Cong Dong and UVSA used to do the Tet Festival together every year at Garden Grove Park (next to Bolsa Grande HS). Because of the money issue they ended up splitting but again this is all a hunch. Anyways, this is more for the elder Vietnamese community in my opinion because the entertainment is of people that are probably older Viet comedians or something that I'm very unfamiliar with. They still have those festival carnival games and rides though I think! Highlight: Lowkey I just realized that I do kind of recognize some of the people that will be performing because I used to watch Paris by Night and Van Son and Asia Entertainment and some of these people (ex. Ngoc Minh and magician) are from those shows! Price: $3 for kids under 4 feet and $5 for adults. Parking Tip: Park in the neighborhood or street parking if it gets crowded but I'm pretty sure parking is free. About: This is one of those events that you will absolutely hate if you are claustrophobic. It seriously gets crowded here on New Year's Eve. You will be squished and pushed probably but it's a must-go at least once in your life. This is the most famous temple for having a Lunar New Year's Eve celebration. It is also broadcast on Vietnamese television and they have big Viet Celebs perform here as well. There's firecrackers and Mua Lan (lion dancing) and live music. I also love getting my fortune here too from the container with sticks which you have to shake shake shake until a stick comes out with the number of your fortune. Time: Not too sure of when the event starts but I usually go around 11pm to join the festivities and countdown to the new year! Highlight: This event is amazing. Fireworks, Live Music, Lion Dancing, Fortune telling, Temple Food! Parking Tip: Don't even try to find parking near the temple because it gets ridiculous. Don't even park in the Nguoi Viet plaza because that's crowded too and there's a chance your car may get towed. Do a little exercise for the new year and park in some far neighborhood because chances are... you won't find parking and will be stuck in traffic. 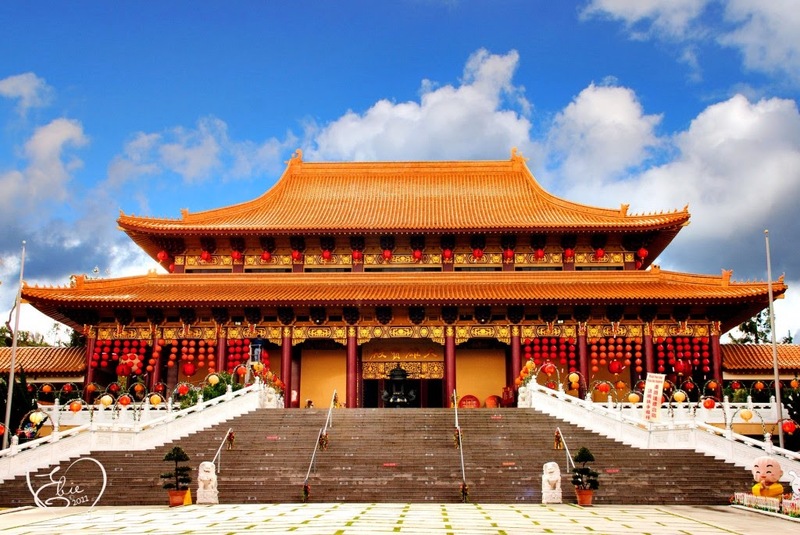 This is a beautiful Taiwanese temple that if you haven't gone, you have to go at least once! It is also the biggest Buddhist Temple in the United States! Due to the overwhelming crowds and popularity, Hsi Lai Temple has loaned another lot for parking! There is also a free shuttle from there to the temple. Details are on the link below.